Home › Workers’ Compensation › FAQ: Workers’ Compensation › How should you notify your employer of the on the job accident? Yes. Georgia law requires injured employees to notify their employers about any on the job injury. You should tell your supervisor as soon as possible after the accident. It is also a great idea to ask your employer to make an incident report about your on the job injury. Verbal and written notice is always best. If you delay in telling your employer until later, then your employer or the adjuster may believe that you were hurt away from your job. The employer and the adjuster also often reject your claim if you delay in seeking medical treatment so if you are hurt get treatment immediately. What is the deadline for notifying our employer about your on the job injury? Georgia workers’ compensation law requires that the injured employee notify their employer about their on the job injury within 30 days of the date of accident. However, there are exceptions so if you waited more than 30 days, then you should call us to discuss this issue further at 877-524-7070 (877-PAIN-LAW). Attorney Richard Griffin strongly recommends that you notify the employer on the date of accident if possible. It is also best to seek emergency medical treatment whenever it is needed. If you don’t need to go to the emergency room, then you should ask your employer for the list of doctors called the Posted Panel of Physicians. Why is it risky to delay in telling your employer about your injury? Sometimes employers and adjusters will deny workers’ compensation claims when the worker does not report it immediately. If you delay in seeking medical treatment, then it becomes even more likely that your claim will be denied. However, it becomes very difficult for an adjuster to deny your claim when you not only reported your accident, but also, obtained medical treatment right after your accident. What problems could you face without the protection of our injury attorneys? Adjusters will often implement the strategy of delay and deny if you are not represented. The delay and deny strategy involves the adjuster delaying or denying authorizing and paying for medical treatment and income benefits. How can the Griffin Law Firm help you with your workers’ comp claim? Attorney Richard Griffin and his workers’ compensation lawyers have the training, experience, and determination needed to protect your rights to income benefits, medical treatment, and permanent partial disability benefits. With our help, you will receive all of the workers’ compensation benefits that you are entitled to receive. We can also fight to make sure you receive the lump sum settlement that you need and deserve. Free Injury Consultation: The workers’ compensation lawyers at the Griffin Law Firm will provide you with a free consultation if you call 877-524-7070 (877­-PAIN-LAW). Requirements for a valid Georgia Workers’ Comp claim? Do you have a case? Many injured workers just don’t know if they have a workers’ compensation claim or not. Often adjusters and employers are denying the claim and refusing to pay workers’ compensation benefits. 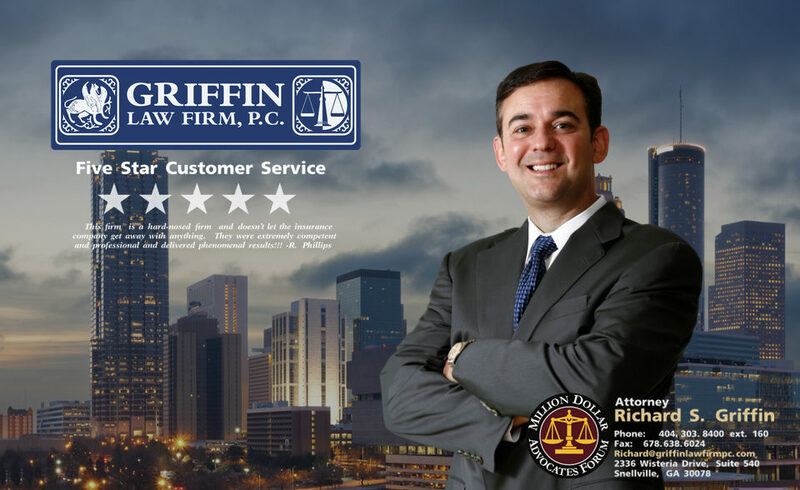 Attorney Richard Griffin strongly recommends that you don’t give up even if your claim is being denied. For a free workers’ compensation evaluation of your claim call the Griffin Law Firm at 877-524-7070 or 877-PAIN-LAW. The call is free, but the information is invaluable. Injury by Accident: The injury normally must be the result of an on the job accident or an occupational disease. If the worker was injured in a fight that is a personal dispute, then the claim is often denied. Injury arising out of employment: Arising out of employment means that the employee was injured while performing his or her job duties for the employer. It can also mean that you are doing something for the benefit of the employer when the accident occurs. If the injury occurs during a personal errand, then the claim is often denied. Injury in the course of employment: This normally means that the on the job accident must have occurred while the injured worker was on the clock or during the work shift. If the accident occurs after hours and when the employee is not performing their job duties, then workers’ compensation normally does not cover the claim. Employers must usually have at least 3 employees: There are exceptions, but normally an employer is only subject to the Workers’ Compensation Act if they have at least 3 employees. Employers with fewer than 3 employees do not have to have workers’ compensation insurance. The claimant must usually be an employee and not a independent contractor: Employees are normally covered by workers’ compensation. Independent contractors are normally not covered by workers’ compensation. There is a very complex evaluation used to determine if you are an employee or an independent contractor. Attorney Richard Griffin encourages you to call to find out if you are an employee or an independent contractor. Why should you consult with our workers’ compensation attorneys? Find out how you may be able to change to a better doctor. Find out how you can be paid for your lost wages. Find out how you can be reimbursed for your mileage. Find out how you can be paid for a permanent impairment rating. Find out how much your workers’ compensation claim is worth.